But his contact with LSU folks dates back to World War II when he met a couple of former Tiger football players in South Pacific combat. Bush was flying a torpedo bomber for the U.S. Navy on Sept. 2, 1944, when his plane was shot down. His orders were to take out a radio station located in the Bonin Islands. Bush’s plane was hit by enemy anti-aircraft fire. Although his aircraft was engulfed by flames, he completed his strafing on the targeted Japanese installation before ditching the plane offshore from Chichi Jima, a Japanese-held island near the more well-known Iwo Jima. 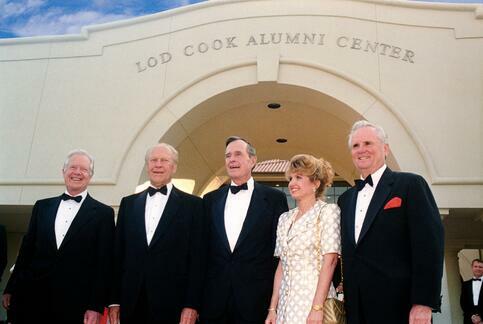 photo: 2001 Lod Cook and George Bush as the dedication of the Lod and Carole Cook Conference Center. He bailed out, deploying his parachute and an inflatable raft. Bush floated for hours before he was rescued by the U.S.S. Finback, a submarine sent to pick up downed pilots. One of the sailors who lifted Bush onto the submarine was Bill Edwards, a former LSU football letterman (1939-40-41) from Little Rock, Ark. After Bush was aboard the sub, Edwards asked him what carrier he was from. “The San Jacinto,” Bush replied. Bush pointed to one of the Hellcat fighters circling above the sub. “I know him, and he’s in that plane right there,” Bush said. Bush and Bird would both win the Distinguished Flying Cross. 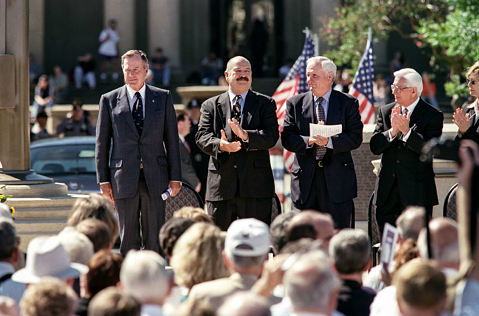 Bush was awarded the medal for his bravery prior to his plane crash and for subsequent action. Bird won the DFC for downing six Japanese planes and helping to sink a Japanese destroyer. 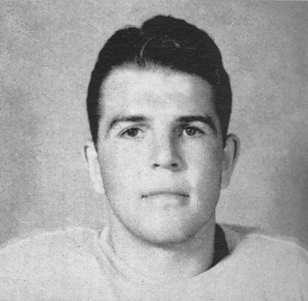 Prior to the war, Bird had a distinguished football career at LSU. The product of Byrd High in Shreveport lettered at tailback for the Tigers in 1939-40-41. Bird was called “the best passer and punter” in the Southeastern Conference by LSU coach Bernie Moore. 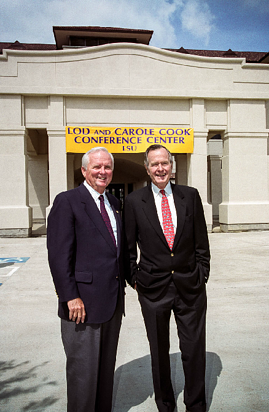 Edwards remained friends with Bush after the war, making periodic contact that included the 1988 Republican National Convention at the Superdome in New Orleans. They were both proud parents. Bush’s son, George W. Bush, became the forty-third president of the United States. 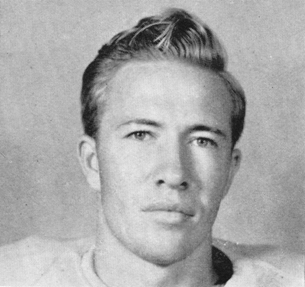 And Edwards’ son, William E. Edwards, Jr., became an LSU football player. were Governor Mike Foster, Lod Cook, and LSU President Allen Copping. Bud Johnson, a former LSU Sports Information director, is author of The Perfect Season: LSU's Magic Year – 1958.